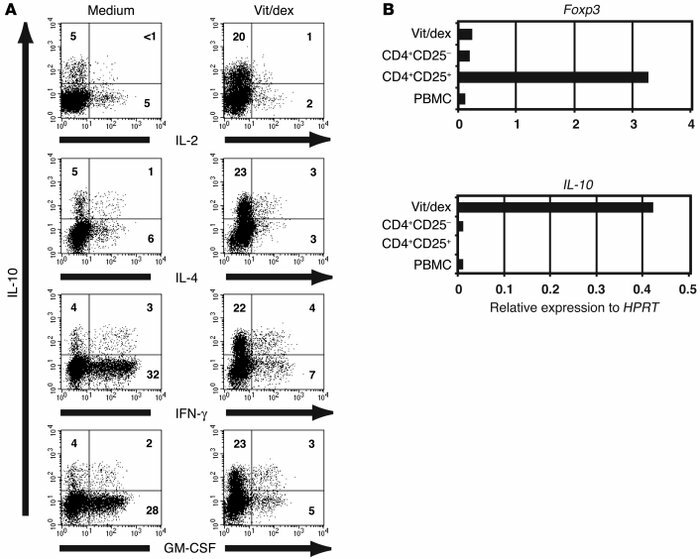 Polyclonal activation of human CD4+ T cells in the presence of dexamethasone plus vitamin D3 induces IL-10 expression, which does not correlate with expression of the transcription factor Foxp3. (A) CD4+ T cells from an SS asthma patient were cultured with APCs, anti-CD3, IL-2, and IL-4 alone (medium) or together with 10–7 M Vitamin D3 and 10–7 M dexamethasone (vit/dex). Cells were restimulated at 7 days with PMA and ionomycin for 4 hours, and coexpression of IL-10 with IL-2, IL-4, IFN-γ, or GM-CSF was analyzed by flow cytometry. Data are representative of 5 experiments. (B) Real-time RT-PCR was performed on PBMCs, freshly isolated CD4+CD25– and CD4+CD25+ T cells, and IL-10–secreting Tregs harvested after 14 days in culture to compare expression of Foxp3 and IL-10. Data are representative of 3 experiments. HPRT, hypoxanthine-guanine phosphoribosyl transferase.